I find that on the weekends when I have nothing pressing to do and nowhere important to be, I eat more than the average person should. Seriously, I can’t stop eating! Every hour or so I find myself stalking my fridge and pantry and rummaging for something to eat. It’s not even that I’m hungry… I think I’m just bored. I’m not the only one, right? Please tell me I’m not alone when I say eating is one of my favourite recreational activities! But even though I’m eating often, I try to nourish my body with clean, healthy, nutritious foods that won’t make me feel sluggish throughout the day. Today, I had a sudden craving for guacamole. Actually I’ve been craving it all week and I finally had the time to make it today. It’s really strange- I really don’t like eating avocados in any form except for in guacamole. On its own, eating avocados, to me, tastes like eating a slab of butter (yuck). 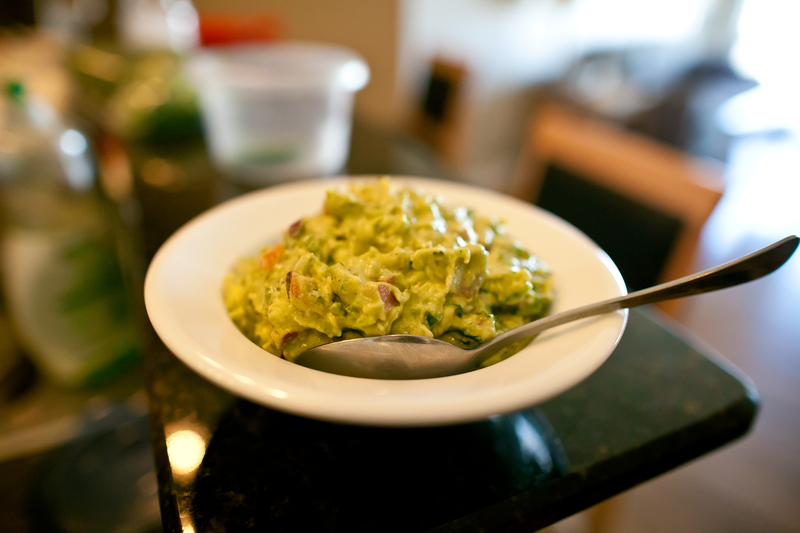 But in guacamole, the tang of the lime and crunch of the onion really make avocado something I really enjoy. Guacamole is simple, quick, and so versatile. You can use it as a dip for your crackers/chips/carrots/celery, put it in your burritos/tacos, or even just eat it on its own as a side to your meal. Yes, avocados are high in fat, but it’s the healthy unsaturated kind that is proven to help lower cholesterol levels. Also, the buttery green fruit is high in fibre and has more potassium than a banana, so all the more reason to make guacamole! Look at that beautiful colour- Isn’t it pretty? 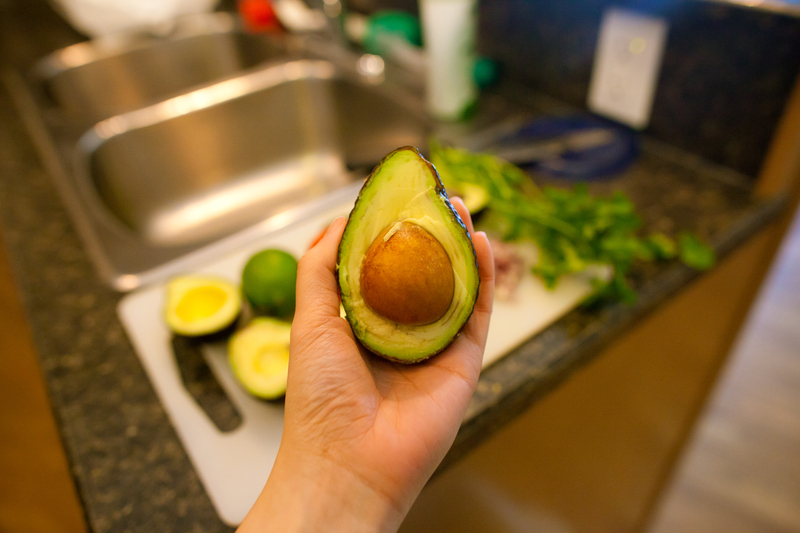 Remove the avocado flesh from the skin and mash together in a bowl using a fork. Keep mashing until no large chunks are longer visible. Squeeze the juice of the lime into the avocado and mix well. 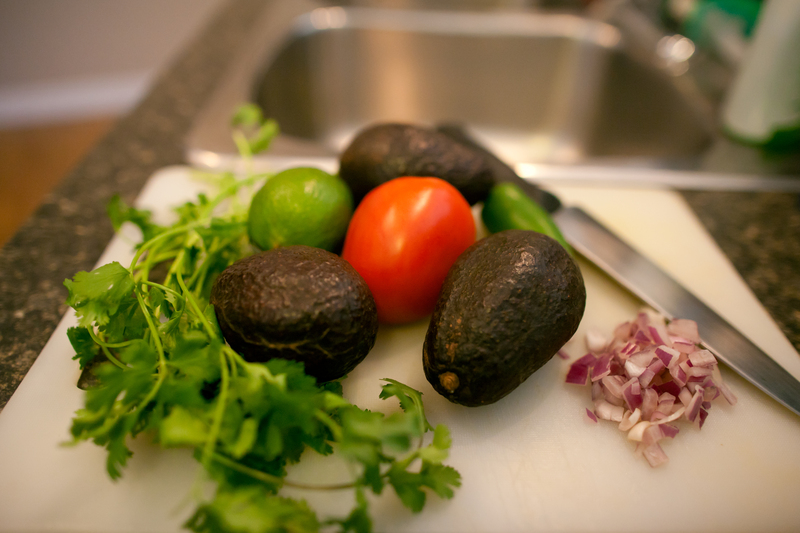 The lime gives a great tang to the dish and prevents the avocado from browning as quickly. Dice the tomato into small cubes and add it to the mixture. Finely dice the onion and add it to the mixture. Make sure the chunks aren’t too big, or else you will be experiencing some serious onion breath after eating this! Remove the stem of the jalapeño pepper and vertically slice it in half. Be sure to remove all the seeds inside. Dice the pepper into tiny tiny cubes and add it to the mixture. You can add as much or as little as you like (Personally I think half a pepper gives you the perfect amount of kick). Roughly chop the cilantro and add it to the mixture. Mix everything up well, making sure each ingredient is evenly distributed, and add salt and pepper to taste. And that’s it! It’s pretty much just cutting everything up and mixing it in a big bowl, haha. Regardless of its simplicity, the end result is still spectacular. I enjoyed my guacamole today with celery sticks, baby carrots and a few rosemary olive oil Triscuits- It was such a spectacular afternoon snack! 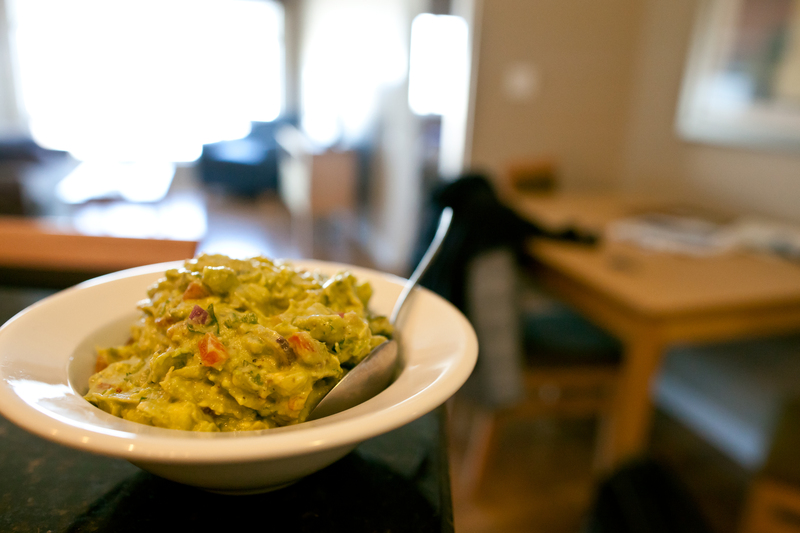 So, next time you’re bored on a lazy Saturday and want to snack on something great, give guacamole a try. I promise you, you won’t regret it!